Click to listen to episode (4:38). From the Cumberland Gap to the Atlantic Ocean, this is Virginia Water Radio for the week of March 11, 2013. This week, we feature a series of mystery sounds. Have a listen for about 20 seconds, and see if you know what time-tested measuring tool is being launched. And here’s a hint, with apologies to Bob Dylan: the answer is blowing in the wind. If you guessed a weather balloon, you’re right! Twice each day, over 90 National Weather Service locations launch weather balloons carrying an electronic sensor that transmits data on the upper atmosphere’s temperature, pressure, humidity, and winds. 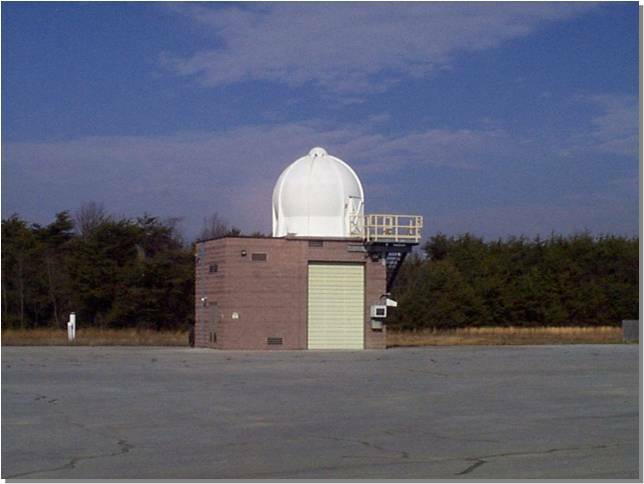 The sounds you heard were from the 6 p.m. launch on February 28, 2013, at the Weather Service’s forecast office in Blacksburg. To learn a bit more about weather balloons and their importance, have a listen to the following two-minute recording from that launch. As Mr. Wilson noted [in the audio], despite the availability of radar, satellite photos, and other tools, meteorologists rely on measurements from balloon launches to make more accurate weather forecasts. Along with skilled human judgments, this combination of simple and sophisticated tools helps us make sense of the complicated air and water masses constantly moving overhead. Thanks to the National Weather Service office in Blacksburg for their help with this week’s episode.For other water sounds and music, and for more Virginia water information, visit our Web site at virginiawaterradio.org, or call us at (540) 231-5463. From the Virginia Water Resources Research Center in Blacksburg, I’m Alan Raflo, thanking you for listening, and wishing you health, wisdom, and good water. Balloon ready for launch (top) and launch site (bottom) at National Weather Service Forecast Office in Blacksburg, Virginia. Photos courtesy of David Wert at that office, 3/11/13. 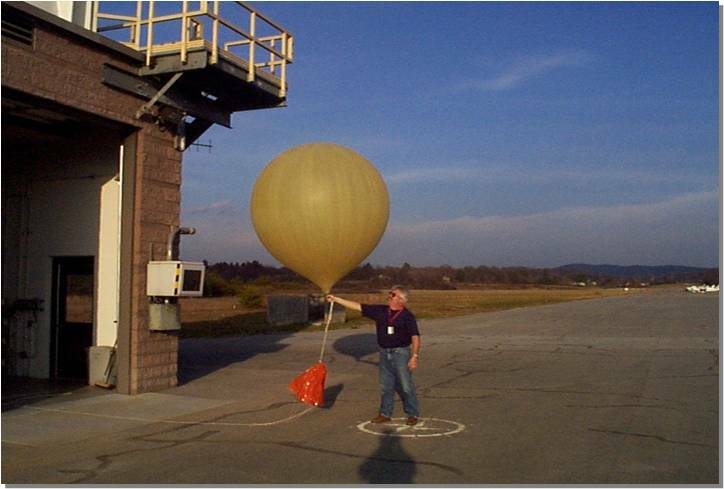 Acknowledgments: Sounds in this episode were recorded during the February 28, 2013, 6 p.m. balloon launch by Meteorologist Intern Patrick Wilson at the Blacksburg, Virginia, National Weather Service forecast office. Please click this link to listen to the full recording (9 minutes/10 seconds) made during that launch. Thanks to Patrick Wilson for allowing Virginia Water Radio to watch and record the launch and for his informative comments, and to David Wert, Meteorologist in Charge at the Blacksburg NWS office, for helping arrange the visit. Sources for more information: The video collection on the “Estuaries Education” Web site, provided by the National Oceanic and Atmospheric Administration and the U.S. EPA, has a “Weather Balloons” video at http://estuaries.noaa.gov/Estuarylive/VideoGallery.aspx?ID=8. The site also has “Weather Forecasting Technology” that discusses other forecasting tools (satellite photos, radar, ground observations, and computer models). Please note that Tuesday, March 12, 2013, has been proclaimed by Gov. Robert McDonnell as Tornado Preparedness Day in Virginia. At 9:45 a.m. on that day, a statewide tornado drill will allow schools, government agencies, businesses, and families to practice tornado-emergency plans. Information on tornadoes, tornado preparedness, and the 2013 statewide tornado drill is available from the Virginia Department of Emergency Management’s (VDEM) Web page for tornadoes at http://www.vaemergency.gov/readyvirginia/stayinformed/tornadoes. Other information on preparing for natural disasters and other potential emergencies is available at VDEM’s “Ready Virginia” Web page at http://www.vaemergency.gov/readyvirginia; that page includes a link to find the emergency manager for one’s particular locality. Contact VDEM at (804) 897-6500 or pio@vdem.virginia.gov.